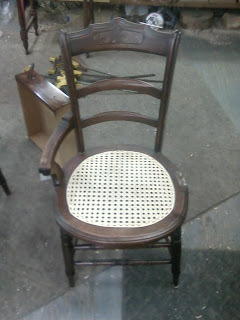 I thought it might be nice to take a break from the restoration posts and star an new section on furniture care. 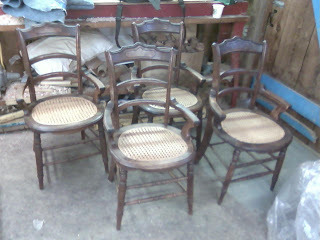 This post and other posts can be accessed at any time by clicking on the label to the right entitled "Furniture Care". When customers ask me how to care for their newly restored furniture, thew first thing I tell them is that they can wax their furniture on occasion. 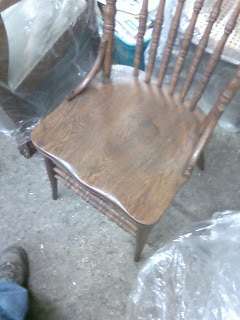 When I return a restored piece to a customer I almost always apply paste wax to it. 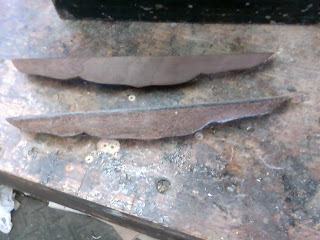 This helps to protect the finish and also evens out the look of the piece. Paste wax only needs to be applied every year or so. 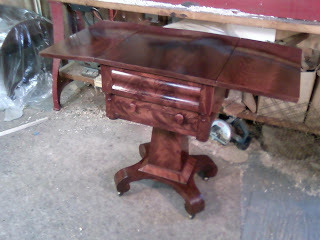 I have several pieces that I waxed four or five years ago now that still look great! Even if you never apply paste wax to a piece that I have restored for you this is valuable knowledge because you can preform this procedure on any piece of furniture, no matter what the finish is. It will improve the overall look of a piece dramatically. For those who have a little extra money to invest in wax there is also Harrel's Paste Wax. 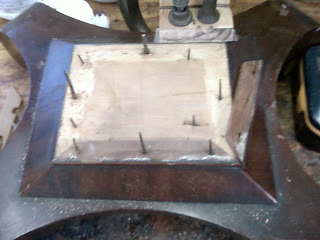 You will need cheese cloth or a fine cotton cloth to apply and to buff the wax. you can pick up cheesecloth at the grocery store or use an old T-shirt. Now that you have all of the Materials necessary lets get started! 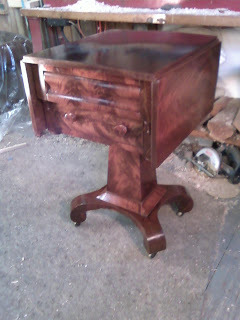 A good piece to start on would be a chest of drawers. 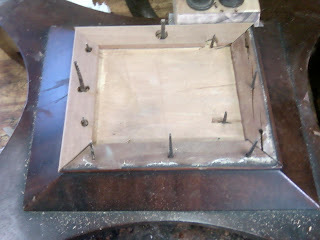 you can start wit the top because it is a smaller flat surface. Take a piece of #0000 steel wool out of the package and unroll it. Then fold it so that the steel wool is about the size of your hand. Once this is done you take the steel wool and rub the finish WITH THE GRAIN!! If you are not sure about grain orientation give me a call and I can explain it. You can apply a fair amount of pressure as you rub the finish. the finish can be abraded in short strokes (especially on the edges) but I usually finish with long strokes. Once you have abraded the finish with the steel wool it should have an even dullness to it. There will also be dust on the piece. You should remove this dust with a clean piece of cheese cloth before applying the wax. Take a piece of cheese cloth and ball it up so that there is a flat side to it. dip the cloth in the wax and get a fair amount on the rag. you should avoid having clumps of wax on the rag. The idea is to apply a thin even coat of wax onto your furniture, not to smear it on. When you have the wax on the rag begin on the side of the furniture farthest from you. apply the wax in 3" to 4" circles. as you circle on the wax move from one side to the other. The result is that you will have a band of circles that goes from one side to the other. When you have achieved this, go back over the band moving from side to side with the grain to straighten the band into one long band versus a series of circles. Once this is done repeat this process until the whole piece is covered. 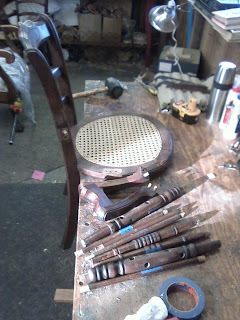 Do not wait until the end to straighten your circles, because the wax dries and you will see the circles after buffing. the reason to apply the wax in a circular motion versus straight with the grain is that if you miss a spot you have a dull area. Applying in a circular motion gives better coverage and also fills any pore or scratch better. Once you have applied the wax wait about 5 minutes for the wax to dry. Once the wax has dried you can start to buff with a clean piece of cheese cloth. buff from side to side with the grain and buff until a sheen starts to develop. You might turn your cheese cloth over periodically to expose a clean surface. the idea with buffing is to remove any excess wax. Once you do this you should see a difference in your finish. If you see a dull spot that you missed, repeat the the procedure in that area only. It should go away. After the wax is applied it will be streaky for a little while. the Harrels wax is better at being less streaky. Once the wax has had further time to dry you can buff it again. 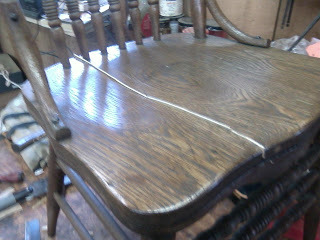 In terms of dusting you can remove dust by wiping the finish (and the wax) with a clean cheese cloth. That is all there is to it. If you run into problems please feel free to contact me with questions. 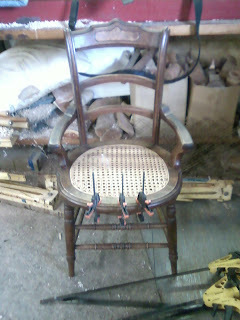 The photos below are of a dining chair which I was asked to glue up. 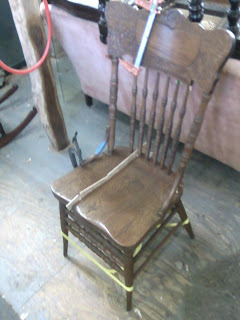 One other problem with this chair was that the seat had a crack running with the grain from back to front. 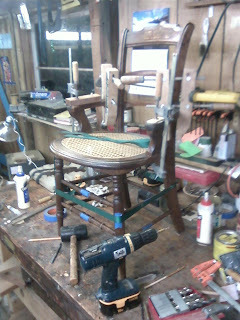 On a plank bottom chair, this would mean gluing the two sections together, but on this particular chair, the seat had boards underneath preventing the seat from coming together. The answer was to insert a long wedge in the gap, carve it down so that it was flush, and touch the wedge up to look like the rest of the seat. 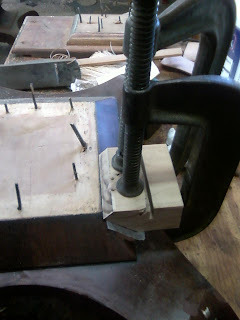 The wedge was cut at a 5 degree angle on the table saw and several kerfs were cut into the wedge across the grain so that it would bend to conform with the seat. 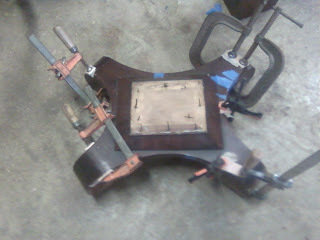 The chair with the spline inserted in the seat. 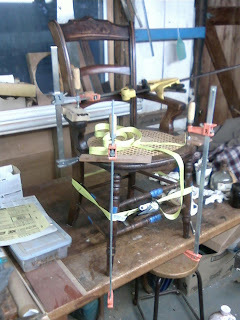 the joinery was also getting glued up on the chair. A close up of the wedge. you can see the places where the wedge was cut to conform to the shape of the seat. 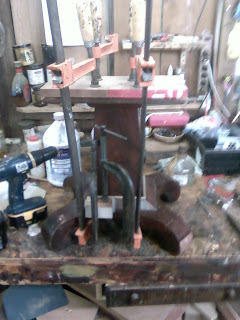 The wedge after most of the excess material has been removed. 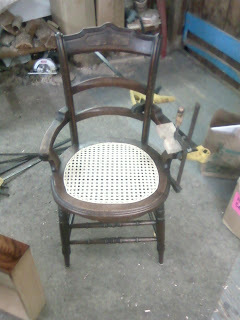 The seat after it has been sanded and touched up. 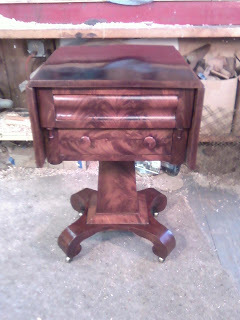 Below are some photos of the two American Empire "Pillar and Scroll" Tables I have been working on completed. 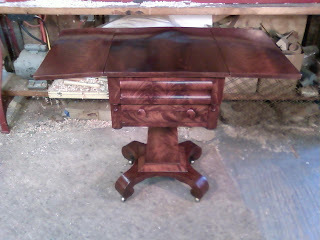 The first table is the work table with drop leaves. If you look at previous posts you can see how different this piece looked when it arrived. 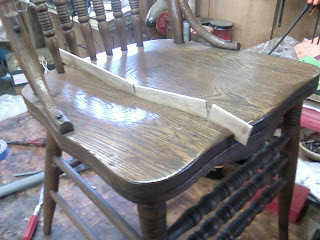 Besides the repairs, the overall color of both tables lightened considerably due to being cleaned. In addition, the grain can be seen much more clearly. The work table with the leaves up. 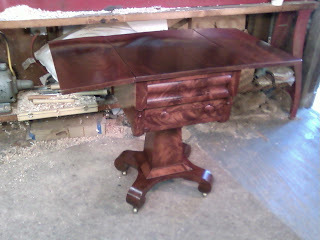 The work table with the drop leaves down. 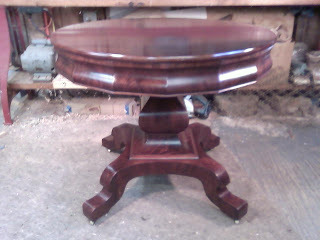 The pedestal or center table . 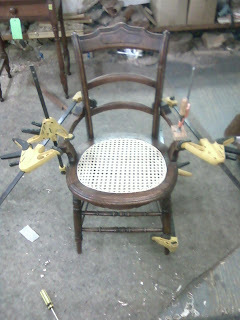 One of the chairs with it's arm removed. Gluing the arm back on. 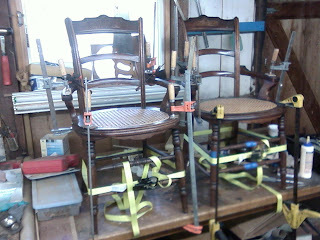 Gluing both arms and some loose joinery on the other chair. You can see the new cane in all of these photos. Happy New Year! I have been working on two American Empire pieces which I have written several previous posts about. 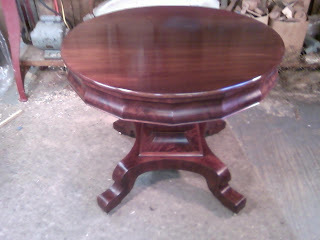 The first is a pedestal table and the second is a drop leaf two drawer stand. 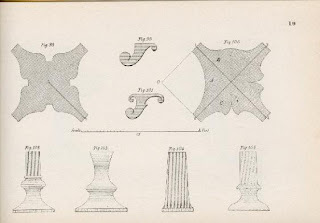 In researching these pieces I discovered that they are both part of a sub-category of American Empire which is called "Pillar and Scroll" furniture. This style of design came about during the later years of the American Empire movement and seems to have come into fashion around 1840. 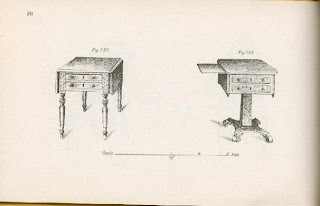 This coincided with the publication of "The Cabinet Makers' Assistant, Embracing the Most Modern Style of Cabinet Furniture" written by Baltimore Maryland architect and cabinetmaker John Hall in the same year. In doing my research I came across a reprint from 1944 of this publication and purchased it. 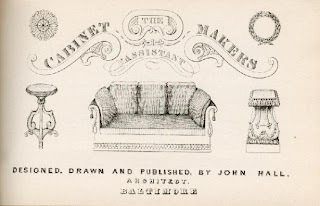 This publication of John Hall's design book in 1840 marked several firsts in the manufacture of furniture in America. First, This was the first design book published in the United States that promoted American designs. This being said, the "Pillar and Scroll" style was heavily influenced European styles but the particular construction methods and overall design of the pieces were something new. 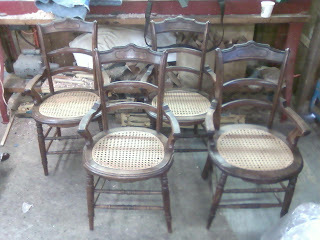 Another first is that this marks a change in direction in furniture manufacture. As it became easier to produce furniture in a mass production setting with the use of mechanical tools like a band saw it became necessary to design furniture that could be constructed in this fashion with ease. The "Pillar and Scroll" style answered this calling. 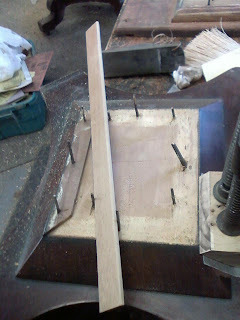 The forms were cut (using a band saw) out of a secondary wood like Pine or Poplar. 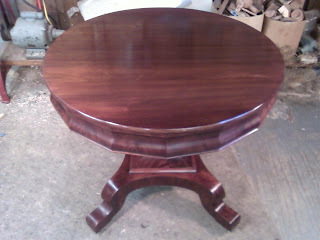 The Mahogany veneers were then applied to the forms to produce an individual section. 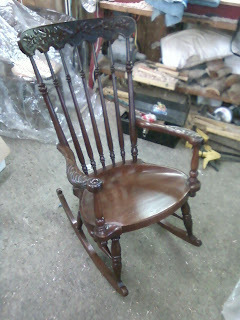 Usually there was no decorative carving and pieces could be put together rapidly and efficiently. Below I have included some pages from the reprint I obtained. they deal with the design elements of the pieces I am working on. The inside cover of the book. 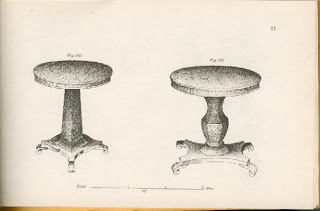 This page shows different shapes used for the base of tables and the feet. It is interesting to note that Hall designed these pieces to have separate feet. 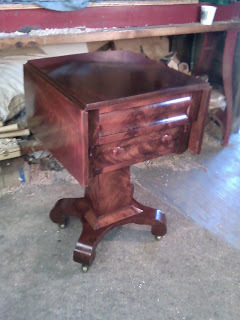 In most of the examples I have seen of this furniture, the feet were cut from the same form as the base. The page also shows some pillar designs. 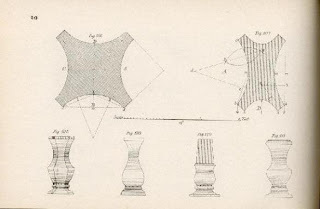 This page shows dimensional drawings of the base and also some more pillar designs. 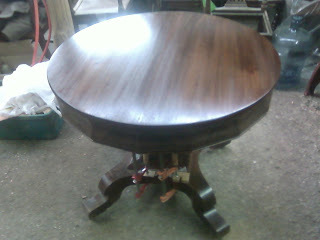 Hall refers to these tables as Ladies' Work Tables. The piece I am working on is a mixture of the two. the top half resembles the drawing on the left while the bottom half the drawing on the right. One other point o interest. 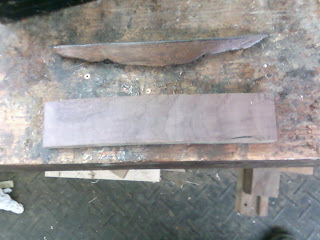 I notices that on the four bottom corners of the top section, the piece had been turned and then something sawed off. My guess is that they may have originally built the piece with legs and then decided to put on a base instead or that the piece had drop finials like the piece on the right which were later cut off. 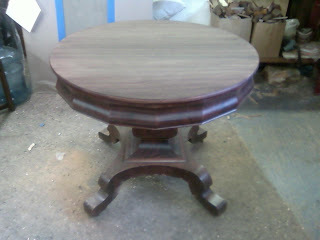 Here are two designs for what hall calls Center Tables. 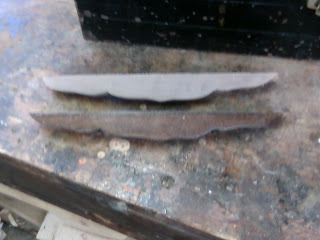 The piece I am working on resembles the piece on the right.